Bussmann LPJ-70SP 70 Amp Fuse Replaces AJT70 Class J "SameDayShipNEW"
BUSSMANN LPJ-150SP 150Amp Fuse LPJ150SP CLASS J AJT150 " SameDayShip"New"
Description: Glass Tube Fuse. Easy to use and handle. Glass tube fuses have different A numbers. Made of high quality material, durable and high precision. This electronic device is designed to help customers when they need it. Ensure the safe operation of the circuit Suitable for customer needs The color of tools may change,please make sure you do not care.Thanks. Specification: Number: 100 Pcs/ Kit Weight: appro x 90g Material:Alloy Application:Wide range of applications What's in the Package: . Trending at C $4.01eBay determines this price through a machine-learned model of the product's sale prices within the last 90 days. I send goods within 12 hours. 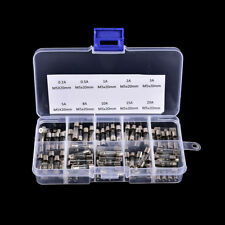 •Content: 10pcs x 0.2A/ 0.5A/ 1A/ 2A/ 3A/ 5A/ 8A/ 10A/ 15A/ 20A; 1pc x Box. Usually I will respond in 24 hours. •Size: 5 x 20mm (0.2" x 0.8"). 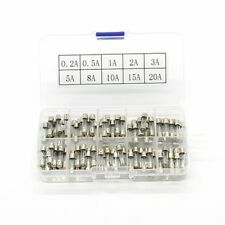 72pcs x Electrical Glass Tube Fuse (8pcs x 0.5A, 8pcs x 1A, 8pcs x 2A, 8pcs x 3A, 8pcs x 5A, 8pcs x 10A. Current: 0.5A，1A, 2A, 3A, 5A, 10A, 15A, 20A, 30A. 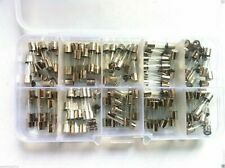 8pcs x 15A, 8pcs x 20A, 8pcs x 30A ). Standard glass tube fuse. Designed with 5 x 20mm ceramic tube, 500mA breaking current.Widely used in power supply, switching power supplies, computers, chargers, telephones, household appliances, communication products, all kinds of instruments and electronic components, electrical products, is indispensable in electrical products safety accessories.Product Name : Ceramic FuseType : Fast BlowBreaking Voltage : 250VBreaking Current : 0.5ADimension : 5 x 20mm/ 0.2" x 0.8" (D*L)Material : Ceramic , MetalNet Weight : 9gPackage : 10Pcs x Ceramic FuseNote:Light shooting and different displays may cause the color of the item in the picture a little different from the real thing.The measurement allowed error is /-1-3 cm. Brand Unbranded MPN Does not Apply EAN 190. Standard glass tube fuse. 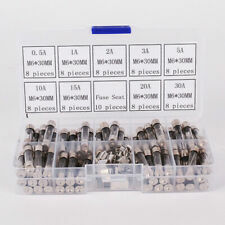 72pcs x Electrical Glass Tube Fuse (8pcs x 0.5A, 8pcs x 1A, 8pcs x 2A, 8pcs x 3A, 8pcs x 5A, 8pcs x 10A. 10pcs x Fuse Seat. ). Trending at C $7.71eBay determines this price through a machine-learned model of the product's sale prices within the last 90 days. PV String Fuses for solar panels gPV up to 1000VDC ​​​​​​​ A range of fuses in a 10x38mm package specifically designer for protection and isolation of photovoltaic strings. The DC fuses are capable of interrupting low overcurrents associated with faulted PV (reverse current, multi-array fault) string arrays. Applications Solar Panels, Solar Photovoltaic, DC Strings. ADVICE: Always use fuses on positive and negative terminal on any photovoltaic string rated up to 1000VDC Electrical Characteristics ---Rated voltage 1000VDC ---Amps 15A ---Rated braking capacity 33kA dc ---Minimum interrupting rating 1.3x In ---Time constant under 1ms Standard IEC 60269-1, IEC 60269-6 Fuse Holder for PV String Fuses This holder is suitable for PV fuses rated 12A, 15A and 20A. The maximum voltage is 1000V. 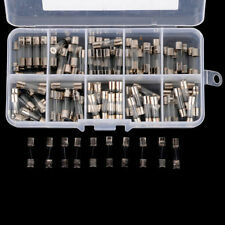 Ceramic Tube Fuse Axial Leads 3.6 x 10mm10A. Type :Quick Fast Blow / Axial. Material: Ceramic. Quantity : 10 Pcs Per Lot. Finger release fuse cap allows ease of use. We will try our best to reduce the risk of the custom duties. Sectional Ability：10KA 1000V AC；10KA 1000V DC. 1000V,11A fuse,fast acting. Suitable for FLUKE F115C/F116C/F117C/F175/F177/F179/F287/F289/F187/F189. 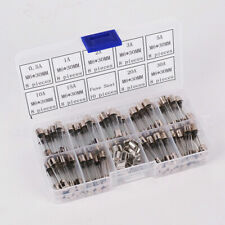 if you also need DMM-B-11A the you can buy theDMM-B-11A DMM-B-44 a set link as below. * 5 Pcs Microwave Oven 6 x 40mm Axial Glass 800mA 0.8A 5KV Fuse Tubes * 6 x 40mm glass tube fuses, serve as overcurrent protection device. 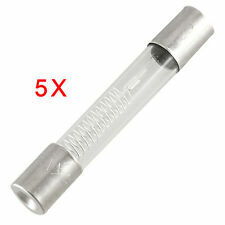 * Replacement type high voltage fuse tube for modern microwave ovens. * This high voltage fuse is wired in series with the high voltage feed from the high voltage transformer to the magnetron. * Size : 6 x 40mm / 0.24" x 1.6" (D*L) * Weight : 8g * Package : 5 x Microwave Oven Fuse Tubes Brand Unbranded MPN Does not apply UPC 6902697986039. OEM FUSE REPLACE BUSSMANN,BUT GOOD QUALITY. 5mm x 20mm F1AL250V. 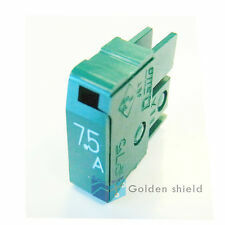 100PCS 1A 250V Fuses 1 Amp Glass Tube Fuse Fast-blow. Content: 100pcs. 1 x100pcs of Glass Tube Fuses. Models: 1A. Size: 5 x 20mm (0.2" x 0.8"). an unpaid case or cancel the order when longer than it. The OPA1622 is a dual-channel, bipolar input, SoundPlus audio operational amplifier. This device has a frequency of 1kHz. Low noise density of 2.8nV/√Hz and low THD N of –119.2dB while driving a 32Ω load with 100mW of output power. Type: SF214E. 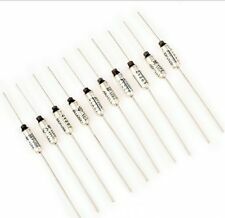 5 x SF214E SEFUSE Cutoffs NEC Thermal Fuse. Rated functional temperature: 216°C. Air conditioners, ventilation fans, electric fans, gas boilers. We would try our best to help you solving any problem. 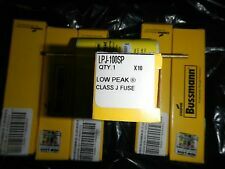 Fuses, 1 lot of 5 Littlefuse 4 Amp Slow-Blow, MDL 4, 1/4" x 1 1/4"
Rate Current:T800mA / T0.8 Amp. Fuction: Slow Blow. Material: Glass. Color: Clear, Silver Tone. Quantity: 10 Pcs Per Lot. Fast Blow, Low Breaking Capacity.Fits for electric equipment.Need professional knowledge to use this product.Product Name :Glass Tube FusesTotal Quantity: 50PcsFeatures:Fast Blow(F) Low Breaking Capacity(L)Rated Voltage: 250VAMP value: 0.25A, 0.3A, 0.5A, 0.75A, 1A, 2.5A, 3A, 4A, 6A, 6.3A(each 5Pcs)Body Size: 5 x 20mm/ 0.2" x 0.8"(D*L)Material: Glass, MetalColor: Silver Tone, ClearPackaging included: 5 x 0.25A Glass Tube Fuses5 x 0.3A Glass Tube Fuses5 x 0.5A Glass Tube Fuses5 x 0.75A Glass Tube Fuses5 x 1A Glass Tube Fuses5 x 2.5A Glass Tube Fuses5 x 3A Glass Tube Fuses5 x 4A Glass Tube Fuses5 x 6A Glass Tube Fuses5 x 6.3A Glass Tube FusesNote: Light shooting and different displays may cause the color of the item in the picture a little different from the re. We will leave it for everyone that leaves it for us. 6 Pieces Used Good Bussmann Limitron KTK-1 Fast Acting 1 Amp Fuses. Condition is Used. Shipped with USPS First Class Package. AXIAL, CERAMIC fuses, 5A 250V. QUALITY fuses! Fuses, 1 lot of 5 Cooper Bussman 3 Amp Slow-Blow, MDL 3, 1/4" x 1 1/4"
English Electric CIS-50 Fuse 50A 600V 60Hz ! WOW ! After winning an item in auction or completing a Buy It Now purchase, you have two check-out options:Check-Out Now! Due to the multiple quantities available, you may not receive the item pictured in the ad above.